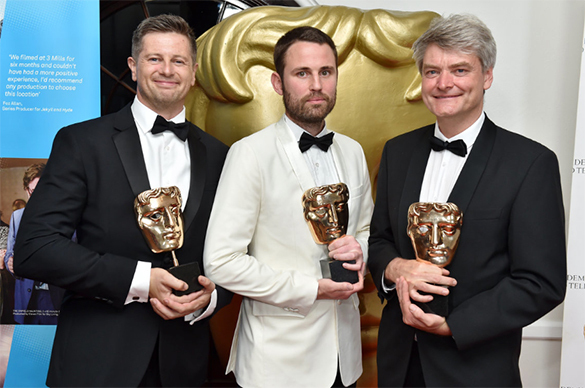 On 23rd April, Mark MacEwan, Rob Whitworth and John were asked to represent the cinematography team of the Planet Earth II series ‘Cities‘ episode at the BAFTA Craft awards. 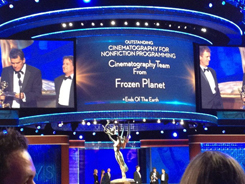 Extraordinarily, all four nominees in the category were episodes from Planet Earth II, so it was a great pleasure to join several wildlife camerapeople and production team members at the awards. 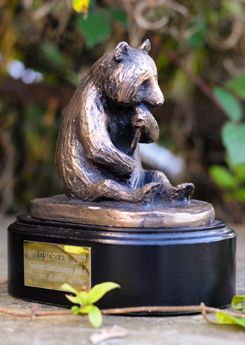 ‘Cities’ won on the night but it is clear that this was an award for the entire team of 22 cinematographers. Filming for Planet Earth II ‘Cities’ episode was a privilege, not least in New York City, where the team were given unique access to bridges and the rooftops of skyscrapers in order to film peregrine falcons for the Cities episode. The recovery of these birds, helped by determined conservationists, is an inspiring success story. In the chapter from The Shark and the Albatross below, you can read what it was like to film the world’s fastest birds as they hunted among Manhattan’s skyscrapers, and about the spectacular recovery of America’s peregrines. You can buy a copy of the book at a special discounted price of £10 for a hardback (including free UK delivery) here. Just enter the discount code SHARKHB10 when you come to pay. For paperback copies use the code SHARK6. John can also send signed hardback copies for the original price of £17.99 plus £3 delivery. Contact him by email in the ‘Social Media & Contact’ sidebar. The first episode of Planet Earth II attracted the largest audience for any natural history series in at least the past fifteen years. Here’s the trailer for the series. The opening shots are from the sequence of urban hyenas John helped to film in Ethiopia. Included in The Guardian’s list of the best nature books of 2015. The Express’s list of the best nature-inspired books of the season. This is a lovely book, vividly written, giving us a fascinating insight into the world of wildlife photography. It is a must for all those who enjoy insights into the natural world. These evocative stories are from the heart of the keenest observer, a skilled cameraman and a superb naturalist…You have crafted a wonderful companion to your visual records, given a knowledgable and fascinated voice to unseen tales, trials and tribulations and you have told the truth about the process and the predicaments. It’s evocative, it made me want to ‘go there’. It’s ‘behind the scenes’ but not the mechanics, rather the feelings. Anna Maria Tremonti interviewed John about the book for The Current on CBC Radio. Every now and then a non-fiction read comes along that’s an utter joy. If you’ve ever dreamed about being a wildlife photographer, you will love this book. Aitchison takes us on his travels among some of the most wild and charismatic of species – polar bears, wolves on the hunt for elk, and humpback whales, and albatrosses just learning to fly – and shows us via well-told and often poetic stories how he gets his stunning images. This is not a how to book, but a book that celebrates all that Aitchison loves about his work and where it takes him and the animals he watches and captures in film or still photos. He knows full well how endangered many of these species are, and his great hope is that the rest of us, looking at his images, reading his tales will love the animals as he does. That we will be moved. I was. You will be. 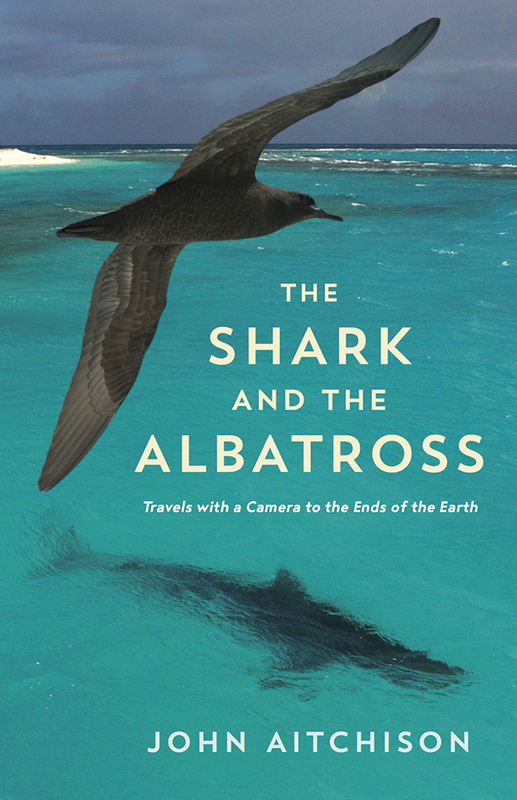 The Shark and the Albatross is published in hardback in the UK by Profile Books and by Greystone Books in North America. Follow them on Twitter @ProfileBooks and @greystonebooks for news about this and other books. Its page on Amazon UK is here. It has more than thirty, five-star readers’ reviews. John can sign and post copies. Email him here. The book has also been published in China. There is also an audio book here. on Audible, read by the author. Here is a short film made for Autumnwatch about migration. In Britain we are lucky to live where swallows spend the summer and geese spend the winter. Between them these birds travel a large part of the globe. When the wind swings into the north and the swallows leave I love to think of them spending the winter in the company of elephants while the geese have just parted from polar bears in Greenland. These are barnacle geese by the way, rather than white-fronted geese. 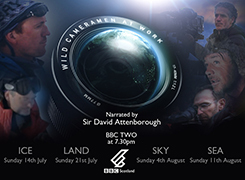 Wild Cameramen at Work, narrated by Sir David Attenborough, featured John, Mark Smith, Doug Allan and Doug Anderson; all Scottish-based wildlife cameramen. This clip is of a murmuration of starlings coming to roost in a reed bed in Gloucestershire, watched by Bill Oddie. DVDs and Blu-ray discs of the series are now available here on Amazon for instance. The spring was very busy. 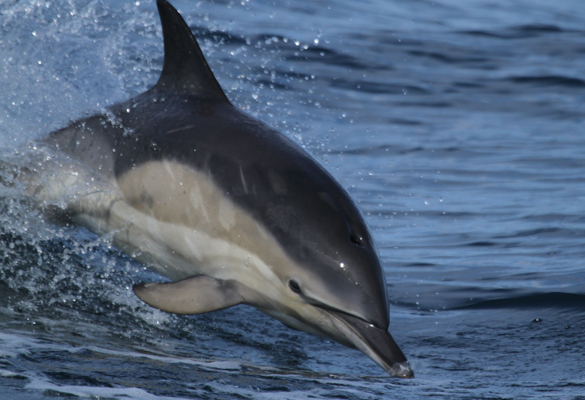 A huge pod of common dolphins which came close to Skye in May were a great bonus. This film, made for the BBC’s flagship Natural World series, follows Sir David Attenborough’s quest to discover how much amber can tell us about the past. 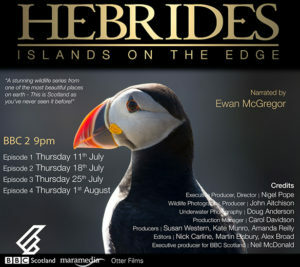 You can watch the whole programme on the BBC Earth Youtube channel here. 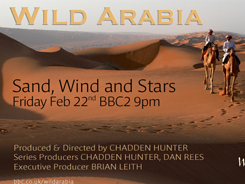 Wild Arabia is a three-part series produced by the BBC Natural History Unit. 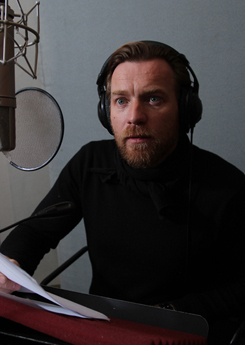 John filmed in Dubai and Abu Dhabi in the United Arab Emirates and in Jordan. As well as filming the flocks of flamingoes which winter close to the spectacular skyline of Dubai city, John also helped film camel racing, falconry in the desert and the migratory harriers which hunt songbirds around irrigated areas in Jordan. 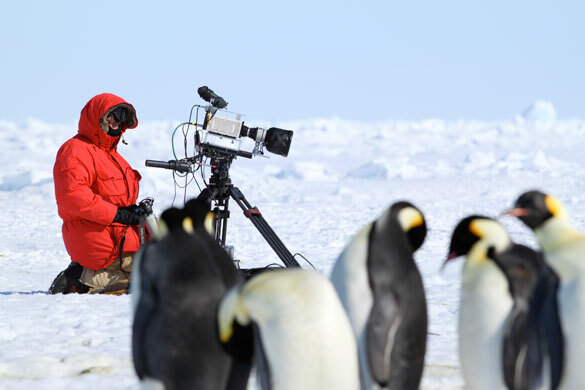 Frozen Planet, the BBC’s polar sequel to Planet Earth, started transmission towards the end of October 2011. There are seven episodes in total. John filmed shearwaters and humpbacked whales gathering to feed in the Aleutians, gentoo penguins exploding from waves and being hunted by southern sealions in the Falkland Islands, emperor penguins leaping from the Ross sea in super slow motion then struggling back to their colony, young adelie penguins leaving their colonies on the Antarctic peninsula and learning to swim while leopard seals hunted them through the ice floes, fur seals fighting and giving birth in South Georgia where young wandering albatross were also taking their first flights, polar bears eating berries and wrestling on the coast of Hudson Bay as well as searching for nesting eider ducks and Arctic terns in Svalbard where other Arctic birds, including Brunnich’s guillemots, nest on immense seacliffs. 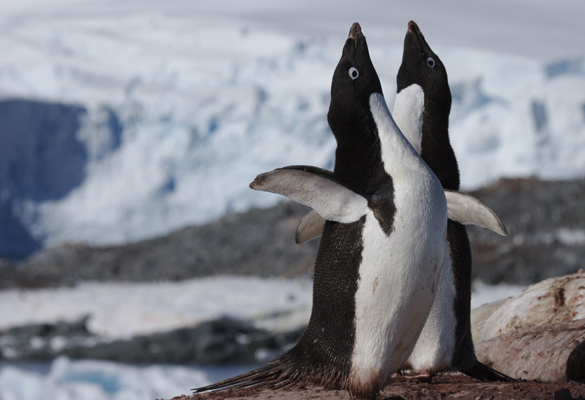 And a slow motion clip of a sealion hunting gentoo penguins from Programme One here. You can listen to all five programmes here. 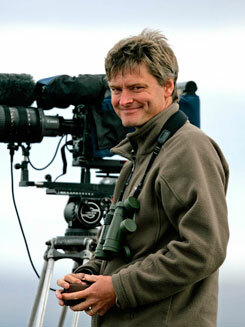 Wildlife cameraman John Aitchison often finds himself in isolated and even dangerous locations across the globe filming wildlife. In this series he reflects on the uniqueness of human experience, the beauty of nature, the fragility of life and the connections which unite society and nature across the globe. On a remote island close to the Antarctic Circle, hungry leopard seals patrol the waters where young Adelie penguins are learning to swim. In Kansas, land of the prairies and the ‘wild west’, John discovers some very funky chickens. John travels to Svalbard to film polar bears hunting for food and reflects on what it means to be patient. On a very small island in the South Atlantic, amidst the noise and aggression of battling male fur seals, something very beautiful and tender happens. John travels to the Aleutian islands to film one of Nature’s greatest feeding spectacles. South Georgia and the British Antarctic Territories regularly issue their own stamps which are collected all over the world. 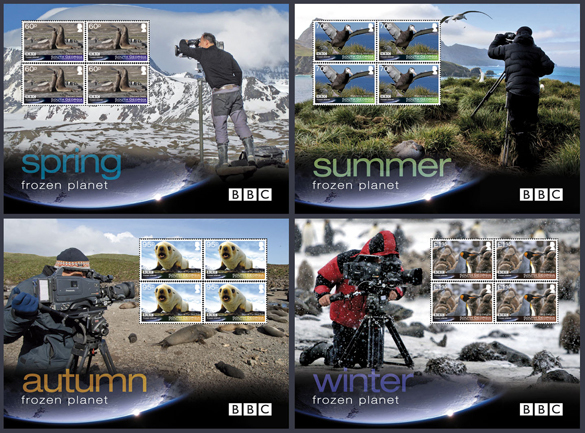 In September 2011, to commemorate the new BBC series Frozen Planet, South Georgia will issue stamps with photos of wildlife and of the four wildlife cameramen Ian McCarthy, John Aitchison, Ted Giffords and Martyn Colbeck filming for the series. Time to get used to having our backs licked! Will it tickle? As well as being “Mr Summer” filming a wandering albatross on the South Georgia stamps, the British Antarctic Territory First Day Cover will feature John filming Adelie penguins on the Antarctic Peninsula. 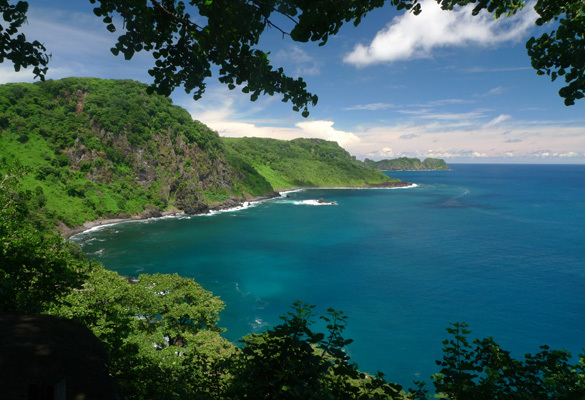 This is the island of Fernando de Noronha off the coast of Brazil. 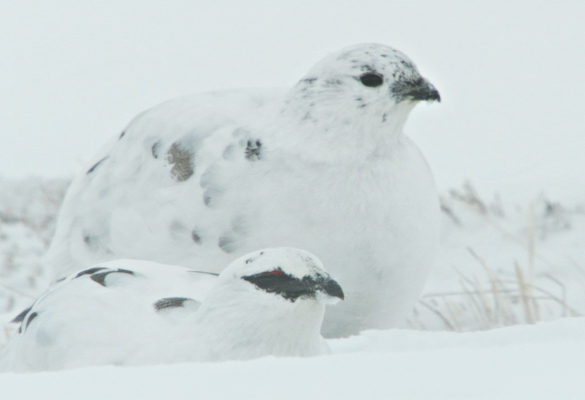 Ptarmigan are some of the hardiest birds in the world. 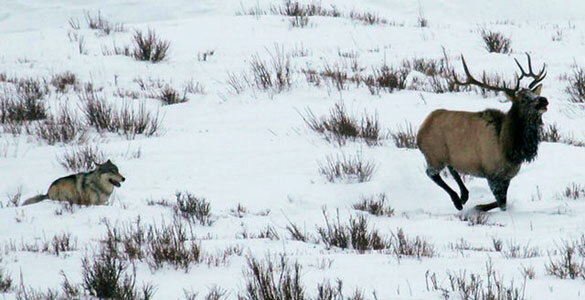 These two were busily feeding in high winds and drifting snow on Cairngorm mountain. 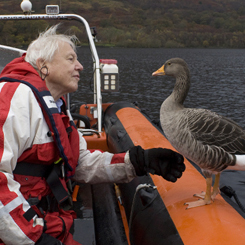 The filming was for a BBC series, Cairngorms – A Year in the Wild. Young polar bears waiting for Hudson Bay to freeze pass the time by wrestling. This looks like play and perhaps it is but it also allows the bears to test each other’s strength, saving them from dangerous fights if they should encounter each other later out on the ice. 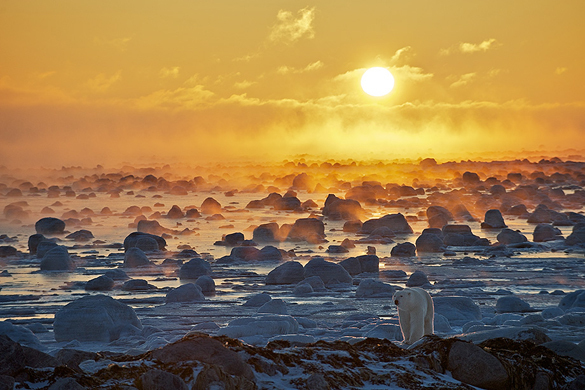 A polar bear at sunrise with ice fog rising behind it. Hudson Bay is starting to freeze. You can see more of Sean’s excellent wildlife photographs here. In this radio series wildlife cameraman, John Aitchison, reflects on the uniqueness of human experience, the beauty of nature, the fragility of life and the connections which unite society and nature across the globe. Photo courtesy Chadden Hunter. Five episodes were broadcast in September and October 2010. 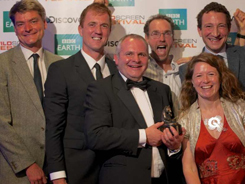 Produced by Sarah Blunt of The BBC Natural History Unit, Bristol. 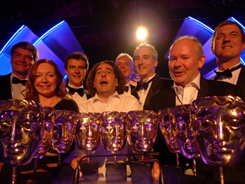 The Yellowstone camera team were given the BAFTA Factual Cinematography award in May. 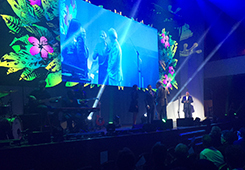 John was delighted to be there with Producer Andrew Murray and AP Nathan Budd to accept the award on everyone’s behalf. 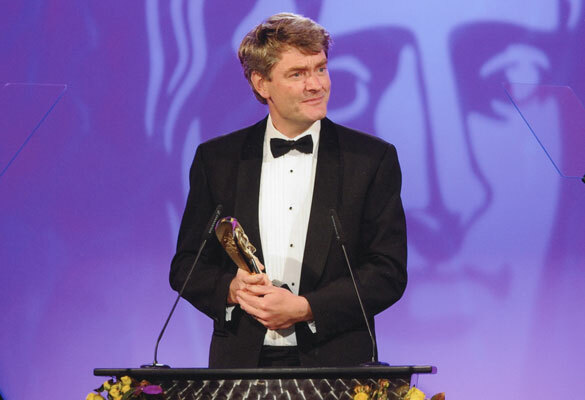 The series was also nominated for a Cinematography Emmy. One episode (“Wolves”) was about trying to film Yellowstone’s Druid Peak wolf pack hunting elk in the depths of winter. All five episodes were broadcast in December 2009 and repeated in 2010. Produced by Sarah Blunt of the BBC Natural History Unit, Bristol.